Okay, so I know I said I was going to clean up my mess, but these two photos of me on Halloween were totally taunting me! They kept saying, “Sarah, scrap me!” …so I did. Since I was already browsing around for inspiration online, I found another site, ScrapMojo, that was hosting a challenge on Alice in Wonderland. I’m not a HUGE fan of this fairytale, but I’ve always thought it was cute, so I decided to play with them too! Look out! You are on a roll tonight! I need to get in that mode with my laundry. My daughter took it upon her self to add all the clean clothes in with all the dirty ones. So now Im going to have a late late night! So pretty!!!! Great take on this challenge!!! the picture is So cute ! 🙂 nice page ! Oh sweet!! Totally love the folded ribbons!! Just wanted to leave you a comment and let you know the RAK was very nice! Thank you so much!!! To everyone else, Sara,h’s RAK’s are over and above! Lots and lots of fun stuff to play with! Love you new LO’s it’s always fun to see the new stuff you have come up with!!!! Have a great FRiday!!! Love the alice layout. You’re definitely creative and the prettiest witch I’ve ever seen. Love the costume. Next year you should go as Jane Fonda just for shits and giggles. That page is adorable and ur costume is super cool! Love it! Thanks so much for playing along! I need to ask you a question. When are the layouts for the sketches over at pink sketches due? Hey gal! Wow! I was greeted with lots of blog entry goodies! You’re on a scrapping roll gal!!! Totally loving all of your LOs!! 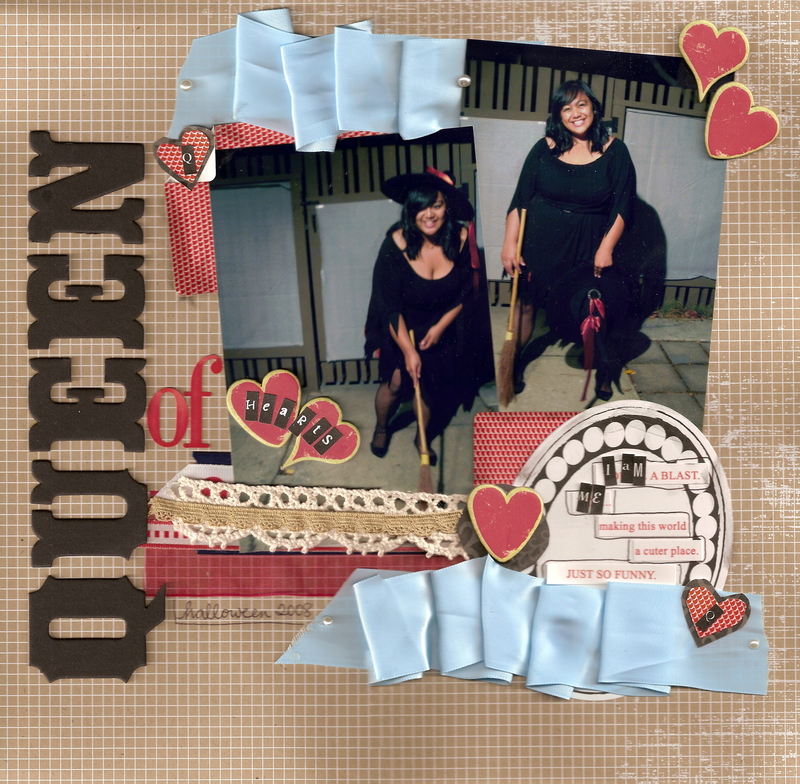 Am loving your Queen of Hearts layout!!! Fantastic take on the mojo challenge! Very cool layout. ANd I love, love the Smell my Feet layout below. Too cute! The lo is da Bomb! I love the colors combo and all the hearts! You are one sweet witch! Thanks so much for playing!!! This layout is terrific! Love the title work! this is so great. love the queen of hearts. love that you used the three photos and the embellishments. So cool! Nice touches of Alice! Thanks for playing along! Awesome lo with fun photos. Thanks so much for playing with us this challenge.